The Amsterdam VOC is a replica of a three-masted sailing ship which lasted only a year after its launch in 1748 for the Dutch East India company (VOC). It was destroyed in a violent storm off the coast of the UK on its way to the Far East. The replica is great fun though and If you have kids who love films like “Pirates of the Caribbean”, they’ll enjoy a trip here as you get to explore the full ship. It’s moored outside the renovated Maritime Museum in the harbour near to the Central Station. This replica was built between 1985 and 1990 by an army of volunteers using traditional methods. When you board though, you’ll realise that It is not an exact replica. You’ll notice that some of the quarters are tiny to make more room for the more visited parts of the ship. If you have children, your visit will no doubt take you longer as they explore every inch of the ship, but without children we’d recommend you allow around an hour. The National Maritime Museum (Nederlands Scheepvaartmuseum) and VOC Amsterdam are open Monday to Sunday from 9am to 5pm. Adult admission for the replica ship is part of the general ticket for the Maritime Museum at 15 Euros per person (2012 prices). 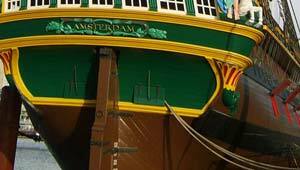 Address: The Amsterdam VOC, National Maritime Museum (Nederlands Scheepvaartmuseum), Kattenburgerplein 1, 1018 KK Amsterdam.